From the dissection of T, B and NK cell signaling pathways to the 3D structure of a T cell receptor-antigenic peptide-MHC complex through the composition of the death signal delivered by T cytolytic lymphocytes and the analysis of the myeloid lineage, the research led by the CIML scientists has contributed to establish the major organization principles governing the immune system, and opened the way to new diagnostic and therapeutic solutions. 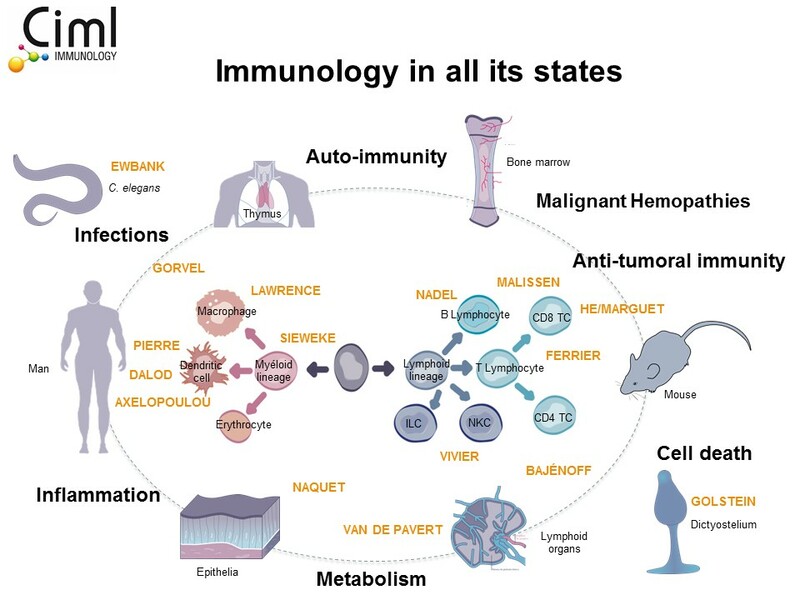 In contact with other sciences, at the interface between physiology and pathology, CIML scientists are now attempting to predict and manipulate the immune system by combining, at the era of functional genomics and systems biology, in vivo analysis and the study of patients. Are Conventional Type 1 Dendritic Cells Critical for Protective Antitumor Immunity and How?